As you know I'm currently back in Hong Kong and usually when I travel to and fro between Singapore and Hong Kong I don't take cleansers or skin care products with me, just because I usually have a set on either sides. HOWEVER, there was an exception for the 3CE Real soft Cleansing Sherbet. This product is incredible and I don't own anything like it. The infamous ponds cold cream which everyone seems to talk about?! yeah, it's got nothing on this product. One thing I noticed is that the models that they've selected on the 3CE page all have very what appears to be very soft, supple baby skin - I mean who doesn't want that?? good marketing technique 3CE ;) I guess that was what drew me into buying the product in the first place. Enough with the blabbering, on to the post we go.
" 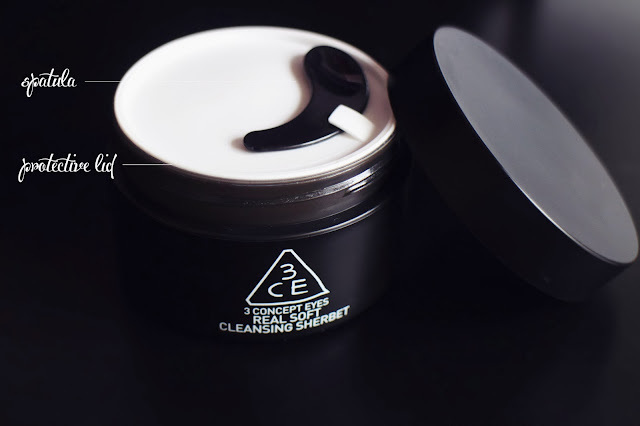 Non-sticky oil-free cleansing sherbet cleanser that removes makeup with a refreshing finish". I couldn't have summed the product up any better, it is as simple as that and it works amazingly. It's packaged in a plastic black tub that opens up to reveal protective cover with a spatula lying on top. Upon removing the protective lid, the product is revealed. It's a rather hygienically packaged and having the spatula just makes it a lot better as opposed to using your fingers to scoop the product out. Could it be better though? Yes - I would prefer the product to be dispensed from a pump, it makes it a lot less prone to possible germ contamination, but the protective cap over it doesn't bother me too much. The best way I can describe it.. is if the Maybelline baby pore eraser / Smashbox photo-ready primer were turned into a cleanser, this would be it. The texture is incredibly smooth, and doesn't tug on my skin upon application. It isn't greasy so you don't have to worry about leaving an oily film across your face. The product doesn't foam up nor lathers up, but washes off and turns the water slightly chalky. I know you might expect a thick petroleum jelly like texture, but I assure you the consistency is no where as thick. 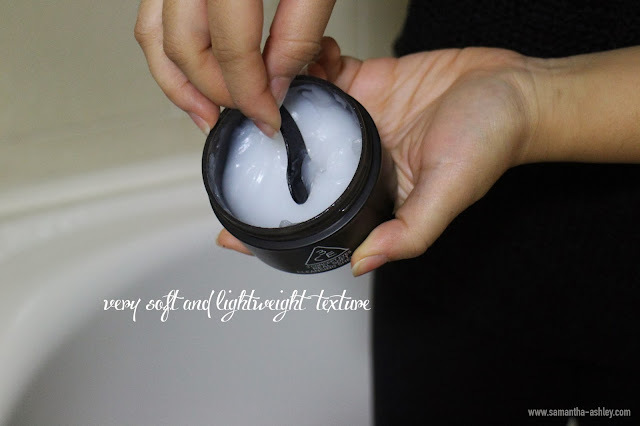 It's incredibly lightweight and silky smooth, softer than scraping through butter. Application is very simple and therapeutic, I honestly love cleansing my skin after a long day of being out and about. No matter how tired I am from a day, I make it a point to take my cleansing routine quite seriously and there's not a day that I skip it. I CANNOT STRESS THE IMPORTANCE OF CLEANSING. The 3CE real soft cleansing sherbet works so amazingly that it has minimised what could be a 2-3 stages of makeup removal into just one! I prefer starting off with my face makeup to remove the concealer, blush, highlighter etc because it's less messy. As you can see, things get messy when the mascara melts off my face as I work on my eye makeup, using my ring finger to gently "melt" the mascara off my eyelashes and the eyeliner off my lids. I do this in a wind-screen wiper motion then followed by a brushing my lashes downwards to remove any mascara that might still be on. After massaging the cleanser a little more, you'll see that your eyeliner has dissolved into almost nothing! 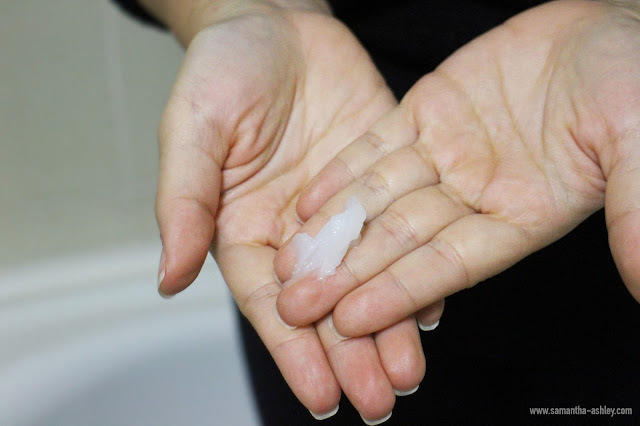 Don't worry, it has not been absorbed into your skin because the cleanser is like a silky layer that sits on top, and the cleanser has just dissolved the product. Upon washing your face with lukewarm water, the water is often grey for the first wash or two to show that your eyeliner has been washed off, a couple washes later, it turns into a milky water and I usually stop washing my face when the water is clear. I then pat dry my face and follow up with my regular shower routine and night time skincare routine. Even without my skincare to follow up, I am able to run around the house to get things done and my skin doesn't feel taught or dry! I've even tried holding off a shower for an hour to two right after cleansing and my skin doesn't feel dry or tight at all. This has seriously become my HOLY GRAIL cleanser and I'll definitely be buying a backup of this product. Lucky for you babes, Luxola has now started selling 3CE products! So definitely head on over to check it out! Everything about this product is amazing, its hydrating, removes all my makeup and leaves my skin feeling fresh and plump. Ok, I'll be honest - at first I didn't believe that the product could remove EVERYTHING, so I took a cotton pad with my Bioderma Crealine cleanser and swiped it all over my face and eyes and it came out CLEAR. Nothing was on it!! I was left speachless and I knew this product does live up to removing absolutely everything down to stubborn waterproof makeup. Now, let's sum up the product shall we? All skin types and anyone looking to switch up their cleansing routine. I personally love using cream cleansers / sherbets over winter because I feel it keeps the moisture in with the cold / drying weather but it's great for all seasons I promise! Travelling between the hot and cold climates, It's not acted up on my skin at all. YES! 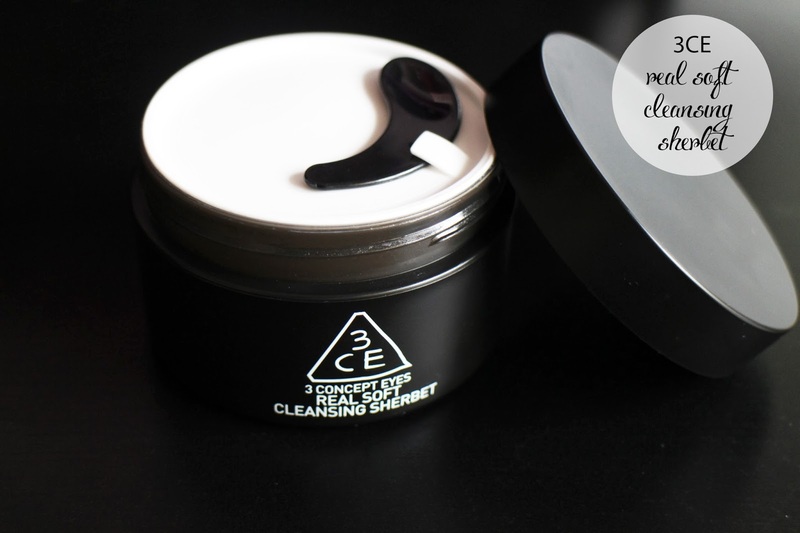 This has made it to my Holy grail cleansers list and is definitely something you have to pick up if you are heading to a stylenanda 3CE counter. I'm already making purchases for both Sam and our dear friend Linda (Silverkis)! It would be a 10 if it were in a pump to keep things hygienic and If it didn't cloud my vision for the couple seconds. Then again, very very minor issues. I will be in Hong Kong for about a month or so, and will definitely be giving other 3CE products a try during the time that I'm here so stay tuned for that. If you have any 3CE products to recommended do leave them in the comments and i'll be sure to check them out! What's your holy grail cleanser? And btw my EH Real Art Cleansing oil always makes my vision become blurry for a few seconds too! lol..
Awh thank you so much, it means a lot to us to get feedback from our readers :) I absolutely love it! Let us know how this works out for you should you try it out . Oooh! I've heard a bit about the Real Art cleansing oily! Which did you prefer out of the two? I enjoy reading your blog. Great job!!!! For this product, can I know will it clear up bb cream as well? awhh thanks :) ! 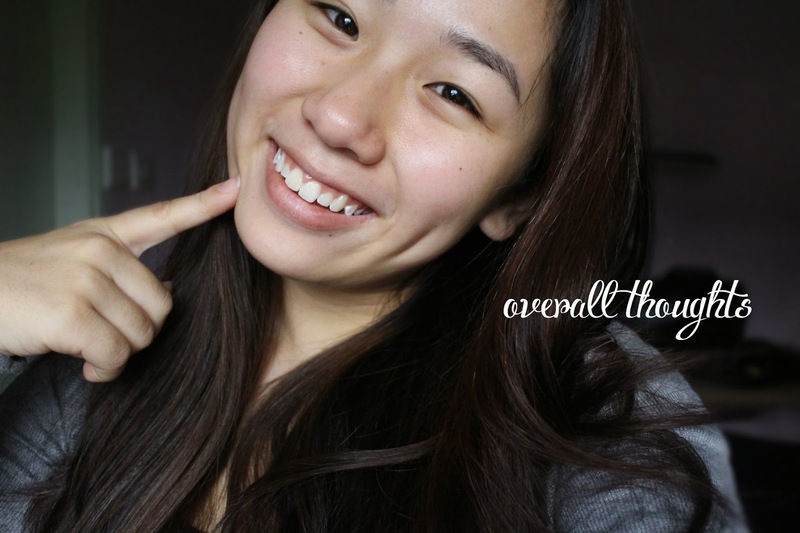 Yes, it clears off everything, foundation, bb cream, waterproof makeup, everything! It's amazing!